Nordstrom's site crashed Thursday and lots of people were suuuuuuuuper upset. I have never been so thankful to have been woken up by my son at 4:30am because I beat the crowd, and the site issues. I continued to shop, however, and kept finding so many adorable things, so here's ANOTHER post! Sorry. Or, you're welcome. However you want to look at it! If you are looking for a fall/winter jacket, they did not disappoint with their selection this year. There are lots of different styles to choose from. 1 Faux leather moto jacket <--under $65!!! This one was a hot item last year, and they brought it back by popular demand. If you are looking for a leather jacket, but don't want to spend the $$ on a real one, this is a great faux option! Last year's version had silver buttons and zipper, but this year's has brassy/gold, which I love! 2 Fur collar Anorak Fur collars are still popular and I love the olive green, but it also comes in black. 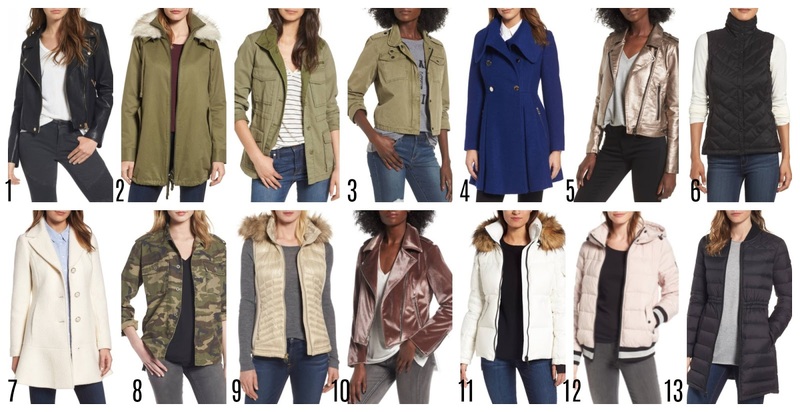 3 Madewell Utility and cropped utility here I invested in a military jacket last year and it was my go to all fall/spring. It is super neutral and goes with more then you may originally think. I have the classic one, but I'm kinda digging the cropped one too! 4 Envelope collar pea coat Such a classic, pretty shape that would be flattering on anyone. 5 Metallic moto LOVE LOVE LOVE this! How cool is this jacket? I just think this is amazing if you can't tell! So fun! 7 Peplum coat Another classic pea coat, and I love the peplum detail. 8 Camo Like the military jacket above, this can be worn with more then you may think. Camo is surprisingly neutral! 9 Fur trimmed vest More fur! 10 Velvet moto I think this is super fun and funky! I love the velvet, which is pretty hot this year. Lots of velvet stuff out there right now. 11 Fur trim puffer Gotta love a good puffer jacket. 13 Quilted Anorak And this one is a little longer if you want something to cover your bum. 1 Sugar I love Sugar lip balm! They feel like butter on your lips. I've never tried the tinted ones, but I'm sure they are great. 3 PMD I don't own one of these, but I have heard great things about them. And I know they rarely go on sale, so if you have been wanting one, I'd jump on this opportunity! 4 Jo Malone set These fragrances are all so unique and they can be layered, so a set like this is perfect for trying out the different scents! 5 Clarisonic Mia This is a great price for a Clarisonic. I usually only see them discounted this low around Black Friday. 6 Supergroup sunscreen This scores a 4 on ewg.org, and that's pretty darn good for sunscreen. On sale, the 3 pack is $38, which is less than $13 per can...that's what you would pay for chemical ridden sunscreen from Target! 7 Drybar set If you're a Drybar fan, then you know this stuff rarely goes on sale! 8 Beauty Blender This is the only way I will put on foundation! It is the best applicator! 9 Nest diffuser Technically not a beauty item, but still worth mentioning! I love Nest candles and diffusers, and they also rarely go on sale, so if you like 'em, stock up while they are discounted! 10 butter London polish Love these colors for fall! 13 St Tropez This is rated as one of the best self tanners! 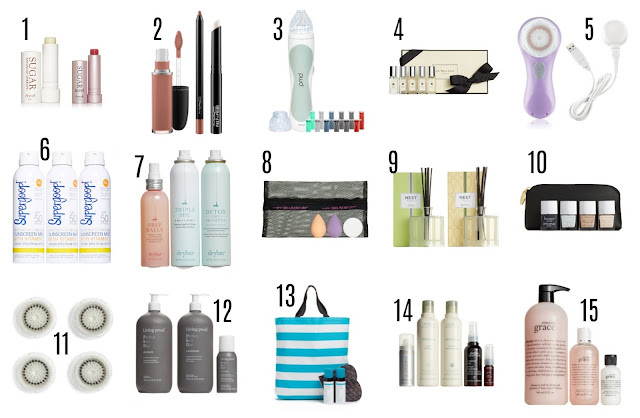 14 Aveda set Aveda on sale? Add to cart. 1 Natori briefs and bikini I ordered both of these to try them. Supposedly they are amazing and stay put. I'll keep you posted on my wedgie status. 2 Seamless bra This is similar to the one I loved from Forever 21 that's no longer available. If you don't like an underwire, you might give this one a try. And it's under $19! 3 Natori Rose Dream bra I ordered this one. 4Natori Feathers bra The reviews are amazing on this one, and I almost ordered it compare. I still might. 6 Spanx Great deals on Spanx! 8 Joggers I live in my joggers...definitely more days then I should. But who's counting? I must take a break now. I really wish I wasn't in the middle of my Whole 30 challenge because I would love a bottle glass of wine! Keep me posted with your purchases and what you love / didn't love! I'll check back next week and let you guys know what I ended up getting and my opinions on everything. Have a great weekend!